Examining how we view art and the world at large. The Mori Museum is renowned for its large-scale shows of contemporary work and high quality retrospectives. The current exhibition “The Kaleidoscopic Eye” gathers together an array of pieces from artists examining how our perceptions contribute to the way we interpret both the world of art and the world at large. 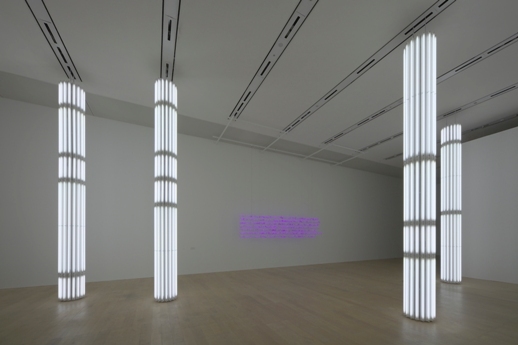 The show’s introduction claimed that it would “expose multiple layers or reality… through works which function as experimental sensory devices…” There are certainly many kinds of disorientating effects on show, ranging from the painfully bright light of Cerith Wyn Evans’s white neon columns in ‘Untitled’ (2008), to the equally sensory-challenging sounds emanating from the multiple screens in Carsten Nicolai’s piece ‘telefunken (wtc)’ (2000). But pain is not always bad. Essentially rooted in a phenomenological approach, this show is incredibly varied – some pieces looked nice but needed wall plaque explanations full of empty and overused art speak to make deeper sense. Thus the pretty bulb walkway in Carsten Höller’s ‘Y’ (2003) “…suggests possibilities and potential for a new world.” My question would be – how exactly? By encouraging people to use eco-friendly light bulbs? One of the first things that came to mind while wandering through was the confusion in contemporary art over the role of phenomenon and perception versus “reading” of the work. Craft versus concept, senses versus mind – good art feeds both. When the art in question is itself causing us to ask “How do I see?”, not just “What do I see?” It is, potentially, a wonderful place to begin a dialogue about the nature of praxis. The pieces that seemed to bring out the more interesting questions that this show’s theme suggests had a simplicity and elegance, proving that the best works speak for themselves. 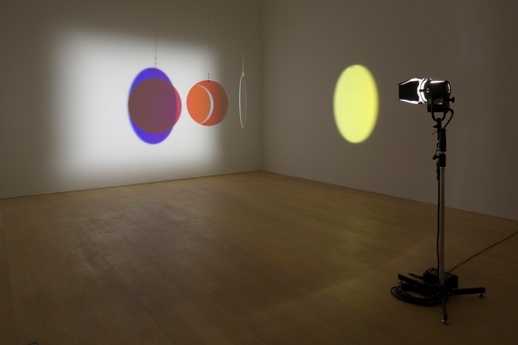 Olafur Eliasson’s contribution ‘Your welcome reflected’ (2003) was not only beautiful to look at but made you question the way the eye perceives things. Two suspended glass circles and a spotlight revealed how color changes with movement and light, creating hypnotic color shadows on the wall. Other highlights included John M Armleder’s ‘Global Domes XII’ (2000), a room full of mirror balls refracting light into a ceiling like a snowstorm. 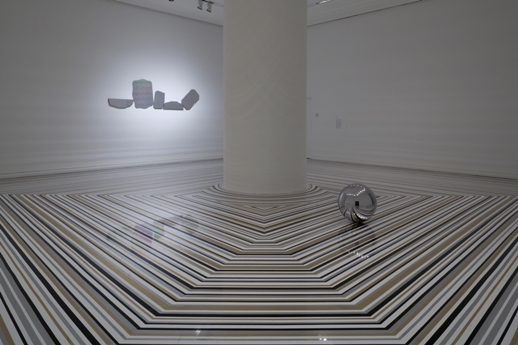 Complementing Jim Lambie’s tape-decorated floor, the strange reflecting object by Jeppe Hein was a ball moving around, giving the room a distinctively Alice in Wonderland atmosphere. Perhaps there is still space for art to delight and confront us with the potential of materials, and for our way of seeing to be changed. This show is an interesting attempt to highlight work which errs on the side of whimsy but which is, nevertheless a foray into questions of perception and reality. The deeper question of what constitutes perception itself and how that effects our decisions and actions in the ‘real’ world is a debate which will no doubt continue in different kind of show.